Yesterday's email from SarahPAC reminds us of the importance of this critical election cycle and that your support of these endorsed candidates is vital to restoring this great nation. "The last thing we need is Washington D.C. vetting our candidates"
In 2013, Governor Sarah Palin said that she was "Loaded for Bear." She said she was ready to get behind good, common sense, grassroots, conservative candidates from outside the political status quo in 2014, because "the last thing we need is to have Washington D.C. vetting our candidates." November is just around the corner and Governor Palin has endorsed a diverse group of seven bold, fresh, conservative, grassroots candidates for U.S. Senate from across America. Watch the video below highlighting some of these conservative U.S. Senate candidates Governor Palin is working to elect this year. All of these candidates are underdogs - not one lead in the polls when Governor Palin endorsed them. Her endorsement caused many in D.C. to dismiss their chances and the power we all have when we come together. Thanks to you - the grassroots - their campaigns have been dramatically turning around! It's time we send these conservatives roaring to the Senate! You can help us by watching our new video and chipping in with a donation today. Ben Sasse (Nebraska) - has been called "Obamacare's Nebraska Nemesis" by The National Review. On Tuesday night, Ben won the Republican nomination for U.S. Senate in Nebraska! We're excited to support him the rest of the way to Washington D.C.
Karen Handel (Georgia) - is running for the U.S. Senate in Georgia and she's eager to shake up the status quo in D.C. Karen's primary is next Tuesday, May 20th! Julianne Ortman (Minnesota) - is running to replace liberal Minnesota Senator Al Franken as a conservative champion. Julianne's nominating convention is right around the corner on May 30th. Joni Ernst (Iowa) - has been a champion for life, small government, and lower taxes. Joni is gaining momentum ahead of her June 3rd Primary in Iowa! She's a pistol packing, Harley riding, Mama Grizzly - she'll make the big spenders in D.C. squeal. Chris McDaniel (Mississippi) - has a proven record of fighting for the critical principles of limited government and free enterprise. Chris is about to face his Mississippi primary on June 3rd. His opponent has been in Washington for over 42 years! T.W. Shannon (Oklahoma) - was the first Republican to ever win his district's seat in the state legislature. He is an important voice for the next generation of our movement, with the conservative record & results as Speaker of the Oklahoma House to back it up. Always up for a fight, T.W. is preparing for his June 24th Primary. Colonel Rob Maness (ret.) (Louisiana) - fought for 32 years in uniform. He is a warrior who will protect our Second Amendment rights and work to defund Obamacare. Rob is running in Louisiana's Jungle Primary on November 4th. He's tough enough to take on the career politicians - and the alligators. We have warriors in the U.S. Senate who need reinforcements: Senator Cruz, Senator Lee, and Senator Fischer are battling tirelessly and these candidates will stand on principal with them. We're in a crucial race to retake a conservative majority in the U.S. Senate and these candidates need our help today. In 2014, Governor Palin has done exactly what she said and found candidates that we can all stand behind. She has already travelled all over to help support them in this cycle. It's time we send these conservatives roaring to the Senate. Help us today! Show your support for Sarah Palin endorsed T.W. Shannon! When: April 24th at 6 p.m. Excited to announce that Governor Sarah Palin is coming to Southwest Florida this week to join me on the campaign trail! Ben is a proven problem solver. A few years ago, Ben took over as president of Midland University in his hometown. The school was on the verge of bankruptcy, but under Ben’s steady leadership and commitment to make tough decisions and reform old policies, Midland is on the path to recovery and has nearly tripled enrollment. Today, it’s the fastest growing school in the Midwest. We need those kinds of results in D.C.
Ben is a leader we need in D.C. now. He won’t forget who sent him there because his life is firmly grounded in his small town Nebraska roots. His family goes to a church where his great-great grandpa carved the altarpiece that is still there today. Ben has his cornhusker common sense and his lovely wife Melissa and their three kids to remind him of what’s important. Melissa is a fellow “hockey mom” to both of Ben’s daughters who play hockey as the only girls on the boy teams. They’ll be able to remind their papa to “Fight like a girl!” in defense of We the People. We have got to be a party that sells the conservative vision of the future. I have also said that the GOP establishment in this country does not understand that the house is on fire and we have to save this country – not tomorrow, or next year, or at some debt-crisis moment in five years, but now. A man of action is exactly what we need in D.C.
Tom Coburn leaves large conservative shoes to fill as he retires from the U.S. Senate. At 6’5 feet tall, T.W. Shannon is just the leader to fill them. T.W. is the underdog in his race, but that’s not a position he’s unfamiliar with. He’s had to beat the odds all of his life. He became the first Republican to ever win his district’s seat in the Oklahoma state legislature even though the naysayers said it couldn't be done. When he sought to be Speaker of the House, the naysayers said he was too young and too conservative to win. But his colleagues chose him anyway, and he became the youngest Speaker in Oklahoma history! We can also rest assured that T.W. will bring to D.C. the integrity and moral compass he acquired growing up attending Bethlehem Baptist Church and teaching Sunday School. T.W. Shannon is exactly the kind of dynamic young conservative leader we need in Washington! Shannon said that he and Palin met at CPAC in 2013, where the spoke about their shared values. “It is hard to put in to words how honored I am to have the confidence and support of a leader like Sarah Palin,” said Shannon. “She is one of the few leaders in this country who is truly committed to the conservative, Constitutional principles that will return our country to greatness. Palin: Texas, it starts with you! It's 2014 so that means mid-terms, primaries, and endorsements. Earlier today, Gov. Sarah Palin reminded the fine people of Texas that it's time to replace the permanent political class with "good new candidates who will go to Washington not to line their own pockets, but to help restore our country". Palin also reminded folks that early voting in the Lone Star State is now underway. Texas, it starts with you! 2014 is here. The choices are becoming clearer, and the battle lines are being drawn. The GOP Beltway crowd has convinced itself that the way to maintain or retake the majority is through compromise and capitulation on important issues like amnesty, Obamacare, and the ever-increasing federal debt. They think that by making deals with a deeply unpopular and divisive incumbent president on issues that Americans oppose, they’ll somehow endear themselves to voters. Enough is enough. The permanent political class in D.C. won’t listen. So, let’s start putting our efforts behind good new candidates who will go to Washington not to line their own pockets, but to help restore our country. It’s time to put inspiration, ingenuity, and integrity over incumbency in the GOP. Let’s start in Texas. The lines couldn’t be clearer. Katrina Pierson is an emerging leader and important voice for the future of the grassroots conservative movement. Her life’s story is full of hardships she has fought to overcome, which taught her firsthand the importance of self-reliance, hard work, and the blessings of liberty. A feisty fighter for freedom, Katrina is taking on a powerful incumbent who has so lost touch with the people of his district that he’s not even bothering to spend much time in Texas anymore. It’s not only his district he’s lost touch with, but also the issues important to the voters there. He used his powerful position to oppose the movement to defund Obamacare, has voted to raise the debt ceiling, and has been an advocate for the NSA intrusion into our freedoms. When asked about Katrina’s primary challenge, he said, “these things happen.” Yes, they do. We all know what happens when we come together to support a good candidate like Katrina – the permanent political class loses and We the People win! We win by electing a fighter we can depend on like Katrina Pierson. Ted Cruz calls Katrina “an utterly fearless principled conservative.” He should know. Katrina was among the conservative grassroots warriors in Texas who worked tirelessly to elect Senator Cruz. Early voting started yesterday, Texas. Get out now and vote for Katrina. Send a message to the GOP elites on behalf of Katrina, just like you did for Ted Cruz in 2012. And while you are out there voting for Katrina, check the box for another good conservative – Greg Abbott for Governor of Texas. Like Katrina, Greg has overcome many personal obstacles and challenges, which have made him a believer in the power of liberty and the need to defend our freedoms from the overreach of an out-of-control federal government. If he is good enough for Ted Nugent, he is good enough for me! Sarah Palin appeared on Sean Hannity's Radio Show yesterday to discuss the all important special election that is taking place in New Jersey today. Palin uses her high profile voice bring attention to all the reasons to send candidate Steve Lonegan to the US Senate and also discusses our God-given resources that are underfoot which, used responsibility, would make us more free and independent. 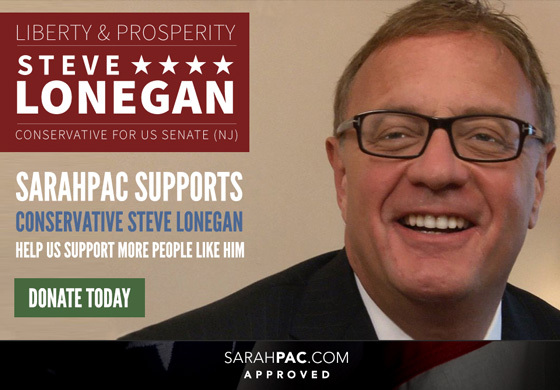 The following email was sent from SarahPAC in support of Steve Lonegan's bid to become the next US Senator from New Jersey as well as other conservative candidates endorsed by SarahPAC. Governor Sarah Palin will be in New Jersey this Saturday to throw her support behind a very important candidate, Mayor Steve Lonegan. We are at a pivotal point in our nation, and New Jersey will choose their next U.S. Senator on October 16. Both of the men running for office have served their state as mayor, but only one has actually governed by the values of New Jersey’s state motto: "Liberty and Prosperity." During one mayor's tenure, his town’s unemployment nearly doubled, taxes skyrocketed, and violent crime increased. In fairness, Newark Mayor Cory Booker may not have noticed these facts between his constant tweeting and trips to Hollywood. The quest for celebrity can be distracting. But contrast Mayor Cory Booker with Mayor Steve Lonegan. As mayor, Steve cut wasteful spending, eliminated wasteful services, stabilized taxes, and reduced debt. Perhaps it was Steve’s prior experience as a successful small business owner and entrepreneur that encouraged him to lead with conservative principles. He understands that government is too often the problem, not the solution. Steve asked Governor Palin for her support, and after reviewing the facts, Governor Palin and SarahPAC have endorsed his candidacy enthusiastically. Now we need your help to support Steve and fight for the limited government principles our nation was founded on. Your contribution of $25, $50, $100, $250 or more will help SarahPAC support Mayor Steve Lonegan and our fight to preserve our founding principles! Help us fight the liberal media’s lies that Steve can’t win in certain areas. His own electoral history proves that theory untrue. New Jersey deserves better, and Steve Lonegan will fight to reduce burdensome federal overreach, eliminate Obamacare, and stand up to the Washington political establishment that threatens our nation’s future. Today I had a great opportunity to attend the Tea Party Express Rally for candidate Steve Lonegan of New Jersey. There's a special election in our state on Wednesday, October 16th to fill the US Senate seat that was vacated earlier this year due to Senator Frank Lautenberg 's death. The Tea Party Express team along with special guest speakers "The Great One", Mark Levin and Governor Sarah Palin rocked the event with music and speeches that fired up the responsive crowd. Steve Lonegan spoke to his supporters with heartfelt passion about his country, his state, his family, and his desire to serve the people of New Jersey. I can tell that Steve Lonegan is ready to fight for "we the people" much like Senator Ted Cruz of Texas and Senator Mike Lee of Utah. Mark Levin takes the stage wearing a hat with "Alaska" emblazoned across the front. Patriots waiving their "Don't Tread on Me" flags. Candidate Steve Lonegan. His compelling story can be found here. Always a crowd pleaser, Gov. Sarah Palin fires up the crowd in New Egypt, NJ. Palin reminds us that New Jersey needs a leader (Lonegan) and not a Tweeter (Booker). Todd Palin (wearing black) and Mark Levin (wearing green). Notice the great sign in the background- "Obama (and) Holder 4 Prison". What's not to love about this guy's ride? If you made it this far, that would be me and my wonderful husband who accompanied me to the rally. In closing, if you live in New Jersey, please get out to vote on Wednesday, October 16th and I would urge you to cast your ballot for Mr. Steve Lonegan. If you don't live in New Jersey but wish to support a conservative candidate, Mr. Lonegan would welcome your campaign donation in any amount as he's being outspent by the Cory Booker campaign 12-1. Together we can send Steve Lonegan to Washington, DC to fight for "we the people". Gov. Sarah Palin and "The Great One", Mark Levin, will headline a rally for US Senate Candidate Steve Lonegan of New Jersey. There is a special election on October 16th to fill the seat which was vacated by Senator Frank Lautenberg's death. Looking forward to joining the "Great One" Mark Levin and the Tea Party Express in NJ this Saturday at a rally for Steve Lonegan. It's this Saturday, 4-6 PM, at New Egypt Speedway, 720 County Road 539, New Egypt, NJ 08533. Tea Party Express anouncement here. Tea Party Express RSVP here.